Do you remember the story of the grasshopper and the ant? While the ant was busy stocking on food for the upcoming rainy season, the grasshopper opted to enjoy the weather and mock the little ant for slaving itself. I always think of this fable every time the third quarter of the year starts. It reminds me to stock up on items, too, And very timely that our favorite Rustan’s Supermarket always has the choicest products on its shelves just in time for the rainy season. 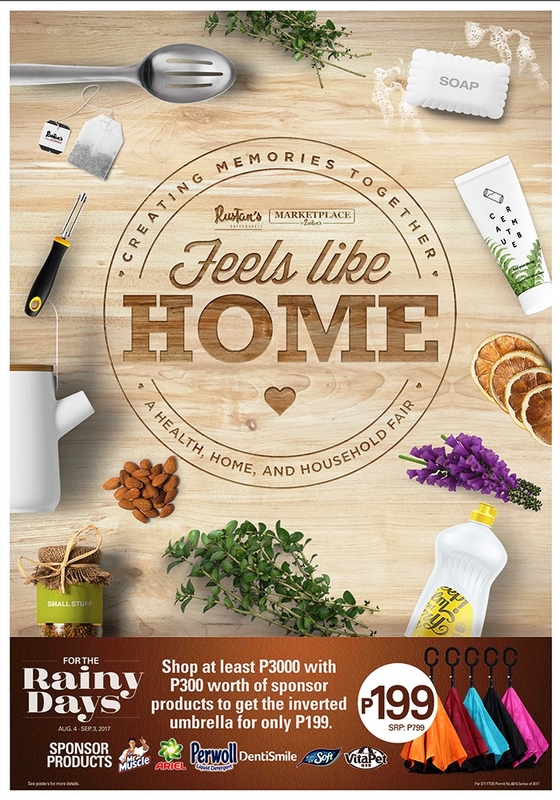 We can easily find all the rainy must-haves at its Feels Like Home: A Health, Home, and Household Fair from August 4 to Sept 3. Aside from its amazing selection of food, Rustan’s Supermarket gives us a complete shopping experience so we can easily get our hands on our essentials from hair care to skin care and personal care. Food containers, plastic wraps, and scrub pads for the kitchen are also available as well as cleaning supplies, first aid kit necessities, and so much more. As a special treat for its customers, Rustan’s Supermarket is also bringing us a special rainy-day promo. Anyone can grab and take home an inverted umbrella for only P199, for every minimum spend of P3000 with at least P300 worth of sponsor products like Ariel, Perwoll, Mr. Muscle, Feathersoft, Vitapet, and Dentismile. So, what are you waiting for? Make sure to keep your home well-stocked and organized during this rainy season by visiting any Rustan’s Supermarket branch near you. Just like the industrious ant, better be well-prepared than sorry. After all, the rainy season is here to stay until the fourth quarter of the year. The inverted umbrella is one super cool innovation. It opens in reverse, and its upside down mechanism has an advantage. For one, the umbrella folds inwards to stop water from dripping on the floor. Secondly, it opens from the top rather than the bottom which makes my boys go gaga over it. That is a good offer! I have to see this inverted umbrella thing, trying to imagine it hard. Stocking up has always been one of the things I do especially with groceries. Some say it’s the European way when you stock up things. I guess it’s really more practical because you can save a lot still. Anyway, that umbrella really interests me so much! I always have a cupboard with different cans of tuna, tomatoes, vegetables, etc., grains, cereals – the kind of items you would eat when you don’t feel like going to the supermarket or when you are sick and can’t go out. It’s important to have a pantry cupboard just in case something happens. I also make sure to always have a pizza in the freezer, for the days when I return home from traveling and the last thing I want is to go shopping. The inverted umbrella sounds like a nice offer, I didn’t hear about it before. Every woman is super happy once she discovers a great supermarket with sales and quality products. As I see Rustan’s supermarket has all the products that I usually buy, so I would be thrilled to visit them. Inverted umbrella is something I really want to see. I always end up losing my umbrella and leaving it in some corner of a cafe or shop. Do they have online shopping already wherein customers can buy from theor wwbsite and have the goods delivered? That would be a great service during the rainy season. I don’t like going out when it’s raining. I would rather enjoy the bed weather. Its an awesome idea to stock up for rainy days. Nothing worse than having to go get that one thing you need and its pouring outside. Id love to try that inverted umbrella! We do not have Rustans here in the province so I won’t be getting that offer. But the umbrella seems to be nice to be added in our household’s collection of umbrellas. You will not know when you need one. I really like those inverted umbrellas. I have two in the house and I make sure to take good care of them. It’s true that we have to stock a lot especially that rainy season is here, for our own convenience. During rainy season, I make a long list of items that we really need for 2 or 3 weeks then I make sure to buy them all and stock them properly. hihi. perhaps we moms are like that. we always would want to be prepared of just anything. and yes, loving our inverted umbrella tlaga. which reminds me to get it from my mom’s house. ihihi.